Who has that Touch of Class? On May 31, the 13-year-old pony from Glenwillow Farm in Jefferson (Frederick County), Spellbound (pictured left), was honored with a Maryland Touch of Class award from the Maryland Horse Industry Board (MHIB). Trained by Kim Stewart, Spellbound holds the title as the nation’s Large Pony Hunter Champion by the U.S. Equestrian Federation and won the Grand Pony Hunter Championship at the May 2014 Devon Horse Show (PA). 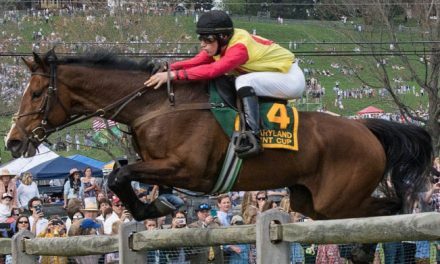 Don Principe (his connections are pictured below), a 15-year-old Hanoverian stallion standing at Hilltop Farm in Cecil County, received the Maryland Touch of Class award on June 23 in the Tea Barn at Fair Hill. This is the third time a Hilltop stallion has been honored with a Touch of Class award, previous winners being Royal Prince (2012) and Qredit (2013). Don Principe is owned by Maryanna Haymon (Columbus, NC). He is currently ranked as the nation’s leading sire of dressage horses by the U.S. Equestrian Federation. The award is named after the Maryland-bred Thoroughbred mare Touch of Class (registered with the Jockey Club as Stillaspill), who won two gold medals in the 1984 Olympics; it is given in recognition of the national or international achievements of Maryland horses, horsemen and horse businesses.